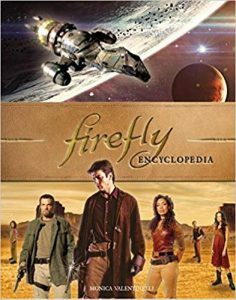 The Firefly Encyclopedia includes a narrative retelling of the story that draws from the Serenity comics, the show’s scripts, and notes/interviews with Joss Whedon. Additionally, Monica tackles her analysis of the show drawing on multiple sources including a short story by Ernest Haycox (1899-9150). Other contributions include an essay about the science of Firefly by Michael S. Brotherton, new interviews with Chris Roberson and Keith R.A. DeCandido, a eulogy for Ron Glass written by Maurice Broaddus, and additional Mandarin Chinese translations by Tony Lee. To celebrate the book’s release, Monica is offering a bonus interview with translator Tony Lee on her blog. The Firefly Encyclopedia is available wherever books are sold, including Barnes & Noble, Target, Amazon, and Books-A-Millon.